James Farm upgrades were set to officially begin on Nov. 26 but kicked off with a groundbreaking on Nov. 16. Word has gotten out about James Farm — a tranquil, but increasingly popular 150-acre nature preserve near Ocean View. Visitors and educational opportunities have increased in the forest, field and bay, and the Delaware Center for the Inland Bays (CIB) is taking the next step to accommodate its use. 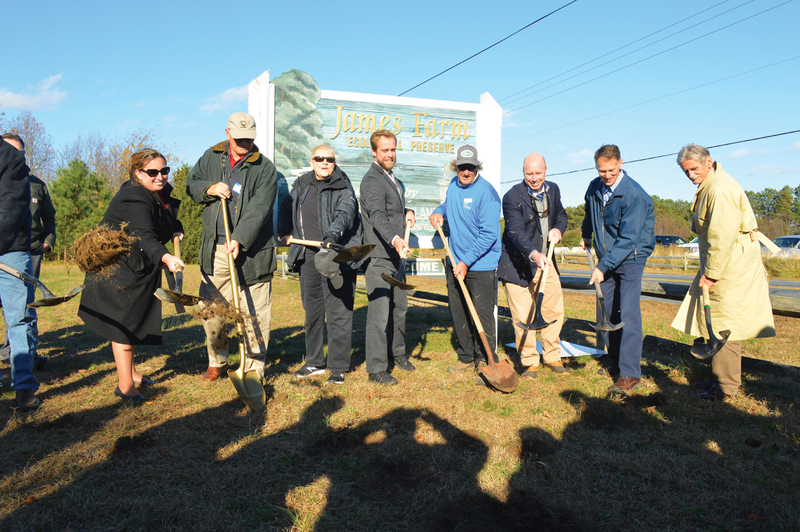 Groundbreaking for Phase 1 of the new James Farm master plan occurred just before Thanksgiving, on Nov. 16. The goal is to accommodate the visitors while retaining the character and quality of the property. The master plan is designed to make it easier to park, teach and work at the preserve, while protecting the plant and animal life. Phase 1 of the project was set to start this week, on Nov. 26, starting at the literal beginning: a new entrance signage and driveway; expanded parking facilities with a safe bus drop-off area for the many student visitors to the preserve each year; an enhanced special-event lawn; and better trailheads into the wilderness. Phase 2 will include additional seating and space for education; storage for education and maintenance equipment; a permanent restroom facility; trail improvements, including the relocation or renovation of failing boardwalks; 18 educational signs; and additional welcome-area amenities, including a donor recognition wall. With all the housing development going on in the area, “This is just a real treat to preserve this large of a parcel right here along the inland bays … so we can all enjoy it,” unchanged from the past, said state Rep. Ron Gray. “Partnerships mean everything now. … I know we are excited,” said Sussex County Administrator Todd Lawson. “This is a very, very unique piece of property in a very, very unique location,” the popularity of which has spurred the County to invest in improvements there. Bason thanked the many donors, legislators and grant administrators who made the project possible. Surrounded by CIB volunteers, who were also on-hand to celebrate with their end-of-year party, Bob Ehemann of the Delaware Department of Natural Resources & Environmental Control (DNREC) pointed out how special it is to see hard work and planning come to life. “Bob Collins is the heart and soul of James Farm. … He has a corps of volunteers who accomplish 95 percent of the work at the James Farm,” Bason lauded. Sue and Mark Cummings are two “newbies” who have volunteered for various CIB projects since moving to Fenwick Island last year. Looking for outdoor activity in their retirement, they were immediately drawn to the weekly Wednesday-morning volunteer sessions at James Farm. From 9 a.m. to noon every Wednesday, people can drop in to help mulch, trim trees, clean up or perform other trail maintenance. “Come on down,” Mark Cummings encouraged to anyone interested in volunteering. “We get to meet a lot of nice people, so that’s been great,” Sue Cummings said. James Farm was originally a gift to the people of Sussex County. The late Mary Lighthipe, a James family descendant, gave the 150 acres in memory of her son, Harold, who died in an automobile accident. The property was dedicated to be used for environmental education and recreational activities. Sussex County asked the CIB to manage the property starting in 1998. James Farm will remain open to the public during construction, although Cedar Road traffic may be impacted. For more information, visit https://www.inlandbays.org/projects-and-issues.